The Hum, a consequence of human influence on space weather deduced from personal experience, the link with geomagnetic pulsation parameters. Dr Chris Barnes Bangor Scientific Consultants. It has recently been shown that the Hum may be due to interaction between world power systems of different frequency standards. Power systems influence space weather so the question is posed can space weather predict the Hum? Subjective Hum levels on specific dates are compared with space weather reports from a reliable source and with spectra from the Kiruna induction magnetometer. Positive conclusions are drawn and the future use of such data for Hum prediction ought to be possible. Links with earthquake prediction are also highlighted. in the USA to between 30-80 Hz with quasi-periodic modulation between .5 and 5 Hz. In other words the sound is rather like that of a distant idling engine or if one can imagine a giant bee trapped in a muffling bottle, its tones octave shifted downwards to account for its size. Some cases of the Hum have been shown to be due to simple low frequency noise pollution but others, indeed by far the greater majority, have proved far more elusive. Any proper explanation relevant to this majority of Hum cases must be able to account for the start up of the phenomenon in the UK being some two decades before the start in the USA! The tantalising paradox is that the Hum seems to be increasing around the World wherever there is infrastructure and yet in the 1970’s both Britain and the USA had similar infrastructure, yet Britain had the Hum and the US did not. Very recently indeed, it has been proposed that influences of power grids on the magnetosphere can account for this1. From that study, the author deduced that certainly in Bangor, Wales’s instances of the Hum seem to coincide with the reception of power line harmonics re-radiated from space. Since frequencies as low as 82 Hz have been reported to have been received at antipodal distances2 and since 60 Hz is close to a natural Schumann resonance of the earth-ionosphere cavity3 and since power line emissions are naturally ‘bursty’4 and thus alone could yield the quasi-periodicity of the Hum, the question is do we need the involvement of any other frequency components at all? Inevitably signals which perturb the ionosphere also perturb the magnetosphere, the classic example is lightning. In other words whether we like it or not there is an inexorable coupling between the two. One type of signal generated in and which arrives from the magnetosphere at much lower frequencies are so called PC1 pulsations, normally but not exclusively in the range 0.2-5Hz. The source of PC1 pulsations is electromagnetic ion cyclotron instability in the equatorial magnetosphere5. Ought we then to be able in some way to use the characteristic of PC1 pulsations to predict the Hum? In a geomagnetic storm, ground induced currents can cause problems for power systems. These are usually longer time period disturbances but can have time periods as low as 2 seconds6. Such short periods are comparable with geomagnetic PC1 pulsations. So could PC1 pulsations have a direct effect on power systems themselves? The converse is almost certainly true. Human activity has been influencing PC1 pulsations for some time7 and8 where Fraser-Smith 1981 states the following; 'measurements have indicated that changes can also be produced by moderately-powered pulsed HF radio (1–20 MHz), transmissions into the ionosphere, high-powered pulsed VLF radio transmissions (3–15 kHz) into the magnetosphere, and by the ULF magnetic noise (frequencies < 5 Hz) from modern dc electric powered mass transit systems. Further, experiments reported by U.S. and Soviet scientists support the suggestion that ULF geomagnetic changes in the ionosphere and magnetosphere can be generated by the passage of a large ULF current around a peninsula in the sea. As a result of these experimental activities, it appears that controlled experiments using artificially generated ULF signals in the ionized upper atmosphere are now feasible’. Finally, the report of a “weekend effect” in geomagnetic activity (as measured by the geomagnetic activity index Ap, for example) suggests that man's activities may already have been subtly influencing geomagnetic activity for many years, possibly because of the radiation from electric power distribution systems into the magnetosphere'. The present author's hypothesis is thus then that the human activity which gives rise to the Hum ought to be detectable as something unusual in the frequency spectra of PC1 pulsations. Secondly, conditions for PC1 pulsations are set by the solar wind speed and reflective in various geomagnetic parameters. Thus the next question to be posed is can the Hum or at least its increased likelihood be predicted from foregoing geomagnetic parameters? The experimental data has been available for several years and consists of private records of the author in which his personal experience of the Hum was logged, dates, times and relative amplitude or relative distress level. 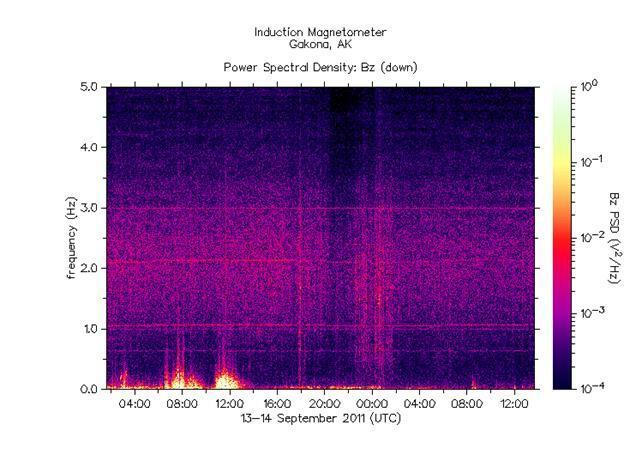 This data can be compared with data from induction magnetometers around the world and with geomagnetic data available at the spaceweather website9. There are induction magnetometers in a number of locations round the world including HAARP at Gakona, Alaska10 and at Kiruna in Sweden11 to name but two. 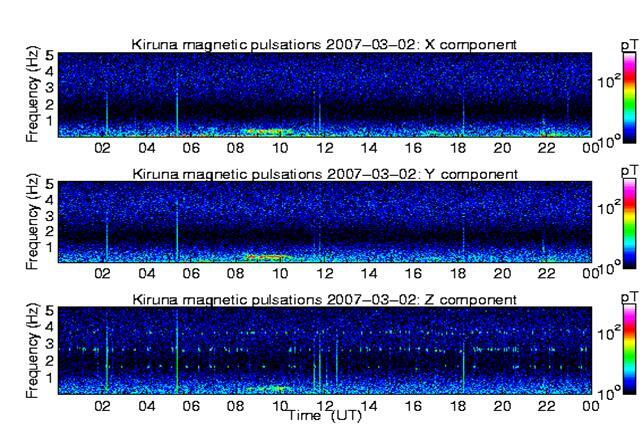 Unfortunately archive data seem to be no longer accessible at HAARP but Kiruna continues to prove very useful. The methodology used was simply to scrutinise the Kiruna spectrography at several times and dates when the Hum was experienced very badly at the author's residence and compare them with times when there was no Hum. With regards to geomagnetic parameters the average geomagnetic field (nT) and Kp values on these same 'Hum' and 'no Hum’ days was taken from http://www.spaceweather.com/. With several years worth of available data there is the potential for a far more in depth, but horrendously time consuming, study here but in order to get these very important general trends released into the public domain as soon as possible the data sets were limited to a dozen strong Hum days taken at random from the years 2007, 2009 and 2011 and similarly for no Hum days. The geomagnetic index Kp had an average value of 1.0 in each case. The author is not a space physicist by training but an intuitive explanation of the result is offered. Presumably slower moving protons and electrons are easier for power line harmonic radiation to interact with. Presumably as the Hum is manifest as a perturbation on a magnetic field the stronger the DC component the stronger the induced ground current. The results of the induction magnetometer study are next shown by way of a few examples. In figure 1 the pulsations are in the form of random noise in two distinct broad bands. The lower band is centred on a bout .3Hz the upper on about 4 Hz. There is what looks like an anthropogenic signal or an earthquake shock precursor signal at about 1930 hours. There are less of these shock signals in figure 1 than in the other figures below and it is worth noting it was almost a month after this record that any significant world earthquakes took place. This record was however preceded by five significant world earthquakes earlier in April. The author has commented in the past about the Hum intensifying before earthquakes and diminishing soon afterwards. There is clearly an incredibly complex link here summed up by the work of Zotov and Gugliemi12. Others have commented too on changes in PC1 pulsations prior to earthquakes13. In essence the background random pulsations in figure 2 look very similar to those in figure 1 but in the Z -component there is lots more evidence of anthropogenic signals at discrete frequencies of 1.7,2,5 and 4 Hz . Other narrow time slot or short shock wideband signal are also seen cutting across all three orthogonal filed directions. The large Tonga earthquake magnitude 7.6 took place on March 19th 2007. Here there are weak at 3-4 Hz in all three directions and an almost continuous signal at about 17Hz in the X and Y component. There are also earthquake shock pre-cursors. The Chile earthquake took place on 14th February 2007. Here there is an almost continuous dash like signal at about .6 Hz in the Z component and weak bursts of signal at about 2 Hz in the X and Y components. There are also short shock earthquake pre-cursors. In that respect three significant earthquakes occurred around the world between January 9th and 19th 2011. Here the z direction has a quasi-continuous signal at 1.7 Hz and weaker bursts at 3, 4 and 5 Hz. There are also a large amount of narrow time broad frequency bursts and comb spectra bursts and earthquake shock pre-cursors common to all three directions. In this respect a significant earthquake occurred in Taiwan on 19th December 2009. The same feature at 0.6 Hz can be seen but features at 1, 1.1, 2.2 and 3 Hz can also bee seen. Due to the nature of ULF pulsation it will of course not be constant across all corners of the globe14. From the author's personal experience the more complex the frequency pattern or the more pronounced the feature, the more intense the Hum as seemed. Generally speaking most of the times these type of features mainly appear in the Z- components but when they also appear in X or Y or both the Hum is even more intense. Another question is how such a richness of frequency component arises. Due to the high non- linearity of the geomagnetic interaction itself much sub-harmonic generation is possible so these frequencies could, potentially all be higher order sub harmonics of 50 and 60 Hz or of the 10 Hz difference between them. It is not unreasonable to suggest this as a possibility although no one else has commented directly upon it. For instance the PC1 production process itself is known to be non-linear15 and artificial PC1 pulsations have been produced at HAARP by employing ULF modulation frequencies16, 17. Such ideas could also account for the one time observation of the signal at 17 Hz, figure 4, which could conceivably be the third sub-harmonic of the European power grid frequency or alternatively be associated with railways18. PC1 pulsation frequencies are not just influenced electromagnetically, there has been shown to be an influence of acoustic signals as well19. Possibly thus earthbound infra sound sources like wind turbines could influence the Hum. This would be another route for them to perturb power systems via ground induced currents from space! Since when PLHR produces MLR a 'bursty' structure is common4 it is perhaps no great surprise that the man- made PC1 effects also appear in short bursts and this in itself may account for part of the quasi-periodicity of the Hum. Further in this respect there has been shown to be a 'weekend effect' in earthquakes7 very similar to the one in power line harmonic radiation itself 4,20 . As stated above, artificial PC1 signals in the 1-3 Hz range can be made be ionospheric heaters like HAARP16,17 and EISCAT21 but cannot usually be sustained for long periods. Since the Hum can last for extended periods of twelve hours or so and pre-dates ionopsheric heating the power grid hypothesis is more attractive. Completing the story is how humans perceive these modified PC1 pulsations. The author's view is they are received as ground currents, which subsequently can re-interact and modulate existing power system ground currents and frequencies (usually present due to phase imbalance) and from there produce noise and vibration by electro-seismic coupling. Pc1 interactions are also proposed to directly affect the propagation and re-radiation of PLHR to ground as MLR4, hence the effective turning on and off of the Hum! Also, there is the possibility of direct infra sound radiation from space. Finally there is the possibly of atmospheric electric field perturbation. Others may perceive geomagnetism directly. Either way the present author has often reported on two channel mechanisms for perception of/arrival of Hum signals previously and thus this present work is not at all inconsistent. The observations made here won’t stop the Hum but at least they can help those afflicted predict to some extent periods of quiet or periods of quiet or periods of disturbance. The human entity is intimately attuned to mother earth whether we like it or not. Geomagnetic activity has shaped our past, even our politics and revolutions22 now modulated by mankind produces the Hum, who knows what is next? When PC1 pulsation spectra are clear of bursts, spikes, comb spectra and dot and dash like features, there is no observed Hum and MLR arising from PLHR are not propagated efficiently back to Earth. Certain sets of geomagnetic features seem to indicate the Hum, it seems to prefer a slow solar wind speed average 352 Km/sec and an average field strength of 4.3nT. These observations won’t stop the Hum but at least they can help those afflicted predict to some extent periods of quiet or periods of quiet or periods of disturbance. The human impact on the Pc1 wave activity, A. Guglielmi, O. Zotov, Journal of Atmospheric and Solar-Terrestrial Physics, Volume 69, Issue 14, October 2007, Pages 1753-1758. Effects of man on geomagnetic activity and pulsations, A.C. Fraser-Smith, Advances in Space Research, Volume 1, Issue 2, 1981, Pages 455-466. Heliogeophysical factors as possible triggers of suicide terroristic acts, Pavel Grigoryev1, Vsevolod Rozanov3, Alexander Vaiserman2, Boris Vladimirskiy, Health 1(4), 294-297 (2009).